We have moved to our NEW LOCATION !!! 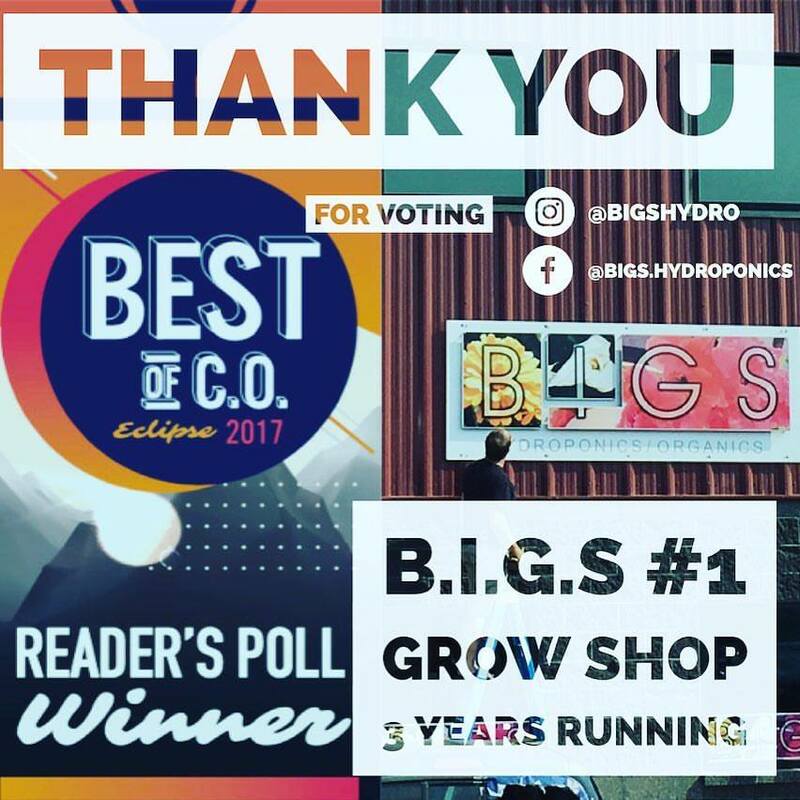 Welcome to the BIGS Hydroponics & Organics RelyLocal Listing! BIGS is a community leader and helps through donations to the Boy's & Girls Clubs, many community events, community gardens including the COCC student garden and is a long time supporter of KPOV, Bend's only public radio. Voted BEST Garden Store for 3 years running! Nick and Ashley Beaudoin created BIGS with one thing in mind: to help growers achieve larger yields of high quality fruits, vegetables and herbs in smaller spaces. This creates a more efficient way of gardening and living in general. After all, we only have one Earth. BIGS carries great products from the top manufacturers in the world! New lines include Aerogarden, Dark Room, Tanglefoot and Humboldt Nutrients. Popular lines from General Hydroponics, Canna, American Agritech, Dutch Master, Fox Farm, Techniflora, BioBizz, Hydro Organics, Future Harvest Development, Lumatek, Sunlight Supply, Hydrofarm, EcoPlus, Active Air, Active Aqua, Vortex Fans, Can Fans & Filters, CAP, Green Air, Down To Earth, Sunshine Mix #4, Advanced Nutrients, MaxiCrop and more. Come in and see what we have for you with monthly specials, competitive prices, expert advice and free samples. Check-out our latest features on our website www.bendsindoor.com where you can utilize our Feed Charts and much more! We now carry over 1000 items in stock including lighting, environmental controls, ventilation, nutrients, growth additives, fruiting and flowering additives, hydroponics systems, soil and soiless mediums, garden tools, books, butane, extractors, vacuum pumps, recovery pumps, vacuum ovens and more. Also on hand are three free indoor gardening publications, Maximum Yield, Garden & Greenhouses and The Growing Edge (while supplies last). Our humble beginnings started right off Century drive on the West side of Bend, OR in 2005. 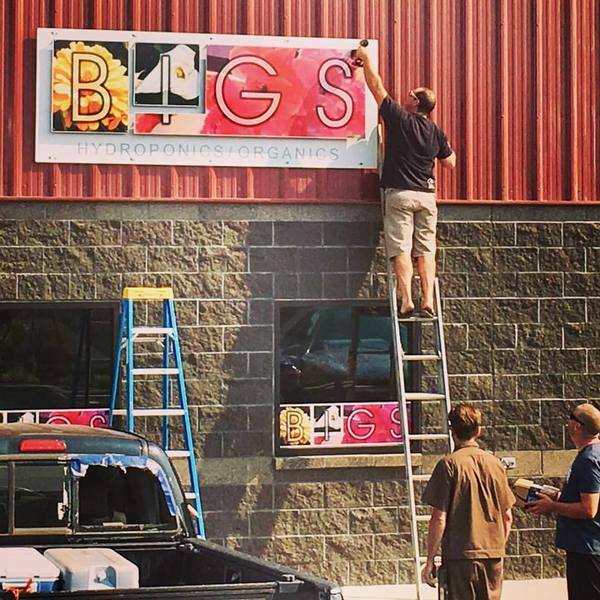 After a few cars were sold to keep it going and many many long days, BIGS became the place to go for specialty garden products in Bend. Nick and Ashley Beaudoin created BIGS with one thing in mind: to help growers achieve larger yields of high quality fruits, vegetables and herbs in smaller spaces. This creates a more efficient way of gardening and living in general. After all, we only have one Earth. Nick Beaudoin, owner and president of BIGS, has been in the industry since early 2003. General Hydroponics hired Nick as a sales representative after graduating with a business degree from Southern Oregon University. Using GH products during college prompted Nick to apply with the oldest manufacturer in the industry. Nick worked every day trying to fix indoor and outdoor gardening problems accross the globe through customer emails, phone calls and over 300 store visits. Marketing was a large part of Nick's job as well and proudly Nick is responsible for GH's trend in sponsorship of festivals across California, starting with Reggae on the River and Earth Dance. Today BIGS sponsors nearly one concert or festival per week to keep music alive and well in Bend and other parts of Oregon. Ashley Beaudoin, owner and vice president of BIGS, has been in the industry since early 2004. Ashley started out helping out GH at trade shows and then moved on to working in a store called Hi-Tech Hydro in Richmond, CA. Working in the most progressive area for hydroponics, the Bay Area, Ashley learned many tips and tricks that the most experienced gardener wants to learn. Today Ashley works every day to keep up customer service with smile inside BIGS. After a decade of business and helping gardeners achieve goals of larger yields and higher quality fruits, vegetables and herbs, BIGS is stronger than ever. We have moved from our original 1400 sq ft shop to a much larger 7600 sq ft landmark of Old Bend. I LOVE BIGS! I can not believe that they can put everything you could ever need into one space. The couple who owns it are amazing and so friendly! The employees are always knowledgable and you can tell they are happy to be there! Thank you BIGS for always having it in stock and always knowing how to solve an issue! This was a pleasant surprise. I was completely oblivious to the fact that Rising Star Futons had closed and "accidentally" walked into BIGS's shop that took over the building. They have some really cool stuff and are extremely knowledgeable. I feel a new hobby coming on.